The shade purple, it sounds a bit daunting at first doesn't it? It's not easy like your muted pink toned lipstick. It's there, vibrant and sometimes it's screaming at you, but worn correctly, it looks out there and glam. I believe anyone can pull off just about every colour, especially purple afterall there are many shades of purple. For example, if you like the purple shade but are too afraid to dive in and wear something very bright, then simply go for a more subtle shade, for this I have picked MUA'S Matte Lipstick in Lilac Belle. My first purple shade I purchased was Sleek's Exxxaggerate, and it definitely suits its name. It is beautiful though, especially when it is paired up with a dark smokey eye or a simple layer of mascara. The only downside of this lipstick, is that it is so DRYING. Literally drying, my lips feel chapped, so definitely put a lot of lip balm on before applying this, and you're good to go. If you looking for a dark and vampy look, then head towards Collection, because they have it covered. Shade 2 Scorned is a very pigmented and glossy lipstick. I pair this lipstick with a simple eye look, mascara on it own or sometimes a little flick of eyeliner. This is because I think it's a great shade to have attention drawn to it, so by simplifying the eyes, this can be achieved. & finally here comes M.A.C, the famous shade Rebel! I apply this product with a lip brush, over a purple toned lip liner, as it can be a lipstick that tends to feather on the edges as it's quite creamy. It's hard to explain this shade, as it has a red/pink undertone, which leaves it having depth on your lips. Again though, so beautiful. What are your favourite purple shades? 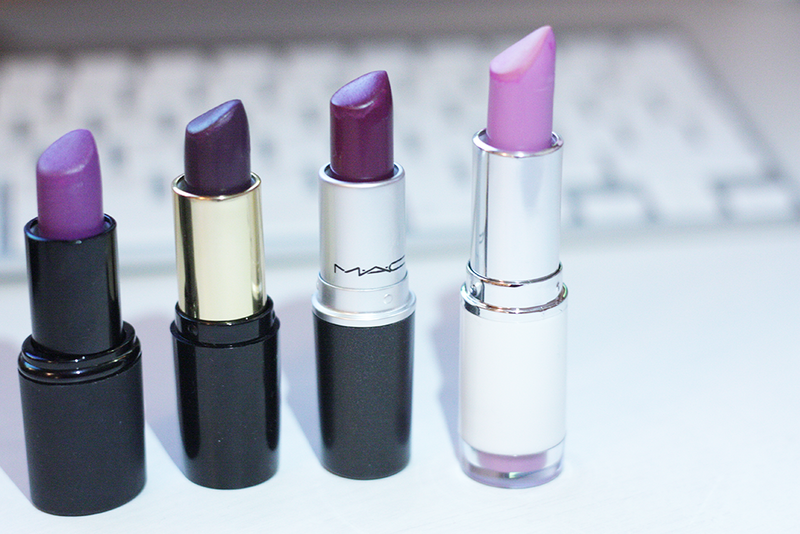 I love purple lipstick as well, I almost bought the mac one last week. 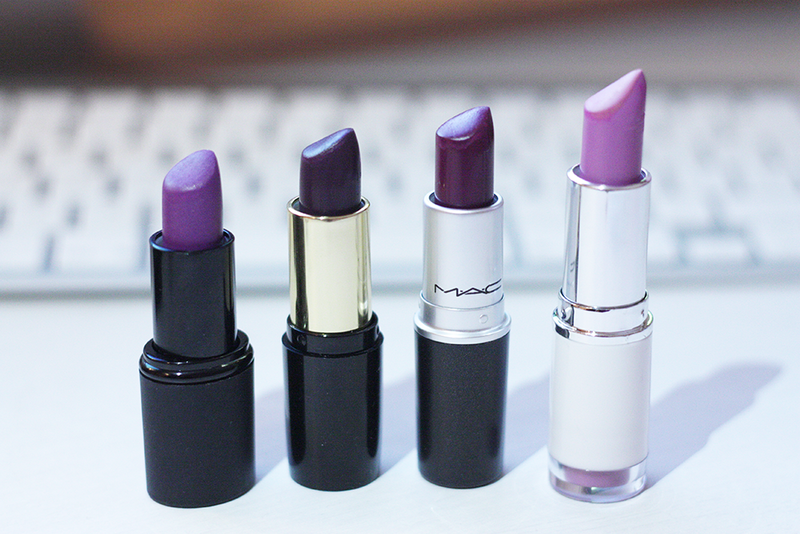 I love purple lipsticks! They are my favourite! They make my teeth whiter and my skin whiter too!!! I expecially love the second lipstick from left! Ps always love your blog! You're so sweet to me!